A Badge Gets You In. Without it, you’re stuck on the sidewalk outside the Salt Palace, gazing up at the glass silos plastered with banners of sleek, spandex-clad athletes. All around you, men and women dressed in the latest micro-fibers and fleece stream through the convention center’s mammoth doors. Clutching cups of scalding coffee and shouldering backpacks better suited for navigating trails than city traffic, they cross West Temple’s seven lanes with loose, mile-eating strides. As they move, their shimmery synthetic shirts wick away the last drops of sweat from their five-mile “wake up” jog up City Creek Canyon. If it’s wintertime, the ones with red cheeks and wide grins probably just returned from a pre-dawn ski run down one of the nearby canyons. And unlike most of us, they hold up their ID badges to pass effortlessly through the glass threshold and into the dazzling commercial spectacle that is Salt Lake City’s Outdoor Retailer (OR) Show. Twice a year, in January and August, tens of thousands of outdoor-industry buyers, manufacturers, retailers and media reps land in Salt Lake City for four days of frenzied show & tell. They transform the Salt Palace into an REI store on steroids, jamming it with new clothing, footwear and high-tech gadgets that mere mortals won’t be able to touch for another year. With its climbing walls, on-mountain demos, and boisterous happy hours, OR might look like a playground for active adults. But it’s also a serious trade show, where million-dollar product launches and retail deals are finalized over pints from local microbreweries. Booths for a thousand brands fill every corner of the show floor, and crowds gather so thickly you can’t throw a carabineer without hitting someone who’s climbed Mount Everest. For several days each summer and winter, OR essentially takes over downtown Salt Lake City. And while the Salt Palace’s cramped quarters lift the show’s energy level, the lack of space is a major reason why, after 16 years of calling Utah home, Outdoor Retailer might soon leave town for good. In summer 2011, Haroutunian had to turn down exhibitors’ requests for 25,000 square feet of additional space, which meant less revenue for the show. “It’s starting to become very difficult for anyone new to come to OR,” he says. Attendees also grumble to Haroutunian about too few hotel rooms and overcrowded restaurants, while visitors from the East Coast complain about limited flights. As the economy gains steam and OR continues to grow, Salt Lake City’s space constraints are only going to become more pressing. And since Nielsen’s contract with the Salt Palace expires in 2014, the trade show’s organizers will be deciding by the end of this year whether to remain in Salt Lake City or jump ship to larger cities like Denver, Anaheim, Chicago, Orlando, Chicago or Las Vegas. When 22,000 Outdoor Retailer attendees fill the Salt Palace on Aug. 2, they’ll make this year’s Summer Market the 44th-largest trade show in the country. The slightly smaller Winter Market ranks as the 58th-largest show. “To host a large trade show like OR twice a year is unique for Salt Lake,” says Scott Beck, president and CEO of Visit Salt Lake, Salt Lake County’s convention and tourism bureau. In contrast, the Salt Palace’s next two biggest shows—the True Value Market and the Hearth, Patio & Barbecue Expo—attract 10,000 to 15,000 attendees, and both rotate through town once every two to three years. But perhaps the more important number is OR’s $40 million economic boost to the Salt Lake City economy. That figure comes from regular surveys of participants by the University of Utah’s Bureau of Economic & Business Research (BEBR). The 2010 survey found that each Summer Market attendee spent almost $750 during the event, including $330 on lodging and $210 on restaurants and food. BEBR also calculated that OR supports approximately 285 jobs in the city. Scott Beck knows that if OR ditches Utah, replacing the show’s $40 million bump—and jobs like Greg Bishop’s—will be tough. As the local point person for retaining the show, his Visit Salt Lake team pitched Nielsen with a new proposal in May 2012 to compete with Denver and four other finalists selected by Nielsen—Anaheim, Orlando, Chicago and Las Vegas. To address the crunch in exhibit space, Beck proposed a multi-venue show utilizing both the Salt Palace and Sandy’s South Towne Exposition Center, which is 16 miles south of downtown but can accommodate an additional 243,000 square feet of exhibit space. The pitch also recommended increasing the scope of the show’s outdoor demo days, a chance for attendees to test-drive new gear like kayaks at Park’s City’s Jordanelle Reservoir in summer, and skis and snowshoes at one of the many local ski resorts in winter. Fixing the city’s shortage of downtown hotel rooms, however, isn’t as easy as spending more time in the mountains. Although Salt Lake City has 8,000 hotel rooms within three miles of the convention center, it can’t compete with the 100,000 rooms in downtown Las Vegas or the 22,000 rooms near Orlando’s convention center. Nicole Orr, marketing manager for Danner Footwear in Portland, Ore., says that when her team tried to reserve additional rooms in Salt Lake City for August, they ran into trouble. “We’d been fortunate in the past because we got rooms way in advance, but this year might be the first year we have to take advantage of hotels 20 miles outside of the city,” she says. Still, an extra thousand hotel rooms located a stone’s throw from the Salt Palace would be helpful, which is why local governments and economic development agencies have been exploring the idea of a convention hotel for the past decade. Along the way, they’ve accumulated a stack of consultant studies that all say the same thing: Salt Lake City needs a headquarter hotel if it wants to remain competitive in the convention business, especially since Denver built a 1,100-room Hyatt next to its convention center in 2005. The prospect of a new hotel took another tentative step forward in June when the Salt Lake County Council voted 6-3 to set aside $25,000 to hire a consultant to survey local municipalities and evaluate funding models. Mathis says four private companies have registered interest in developing the project, and that government funding would be applied to public infrastructure like street lights, sidewalks and meeting-room space. Even if cramped exhibit spaces and limited hotel rooms diminish Salt Lake City’s chances to keep Outdoor Retailer, there is one factor that favors it. And for some, it’s the most important trait of all: Salt Lake City is a real “outdoors” town. Fans of the city point out that this appeal goes beyond its proximity to the mountains—which no other city of comparable size can match—to include the passions of its businesses and residents. “The city feels like it has a culture of people who appreciate the outdoors,” Orr says. “I know individuals who live in Salt Lake who are really into getting the most out of camping, skiing, hiking and cycling, which is why, outside of the logistical challenges, I think it’s such a great home for the show.” Orr would like the show to stay in Utah or move to Denver, which she says registers a comparable outdoors vibe. She says larger venue cities like Anaheim or Las Vegas don’t support the true spirit of Outdoor Retailer. In a June 24 Denver Post article, Richard Scharf, Scott Beck’s counterpart at Visit Denver, noted that if Denver lands the OR show, it would not only attract tens of thousands of delegates to his city, but might also encourage outdoor-product companies to locate in Denver, just as they have in Utah. According to the Economic Development Corporation of Utah, more than 1,000 sports and outdoor-product companies are based in the state. Many of these firms arrived during the 16 years OR has called Salt Lake City home. The state’s business team prominently mentions the show’s presence in its brochures. One of the few Utah outdoors companies that predates OR is Black Diamond, whose CEO, Peter Metcalf, arrived in Salt Lake City in 1991 with a handful of employees. Today, Black Diamond is a $145 million, publicly traded company that employs 320 people in Utah and more internationally. Over the past two decades, Metcalf has been an active proponent of improving outdoor recreation and land protections in Utah, and he played a key role in luring Outdoor Retailer to Salt Lake in 1996. In recent years, Metcalf and other vocal members of the Outdoor Industry Association (OIA), the trade group that is title sponsor of the show, have leveraged the economic impact of their industry in Utah to pressure local politicians on issues like wilderness protection and public-lands conservation. OIA’s executive vice president and chief operating officer, Lori Herrera, says the outdoor industry is linked to the natural environment beyond just sales. Although the majority of OIA’s lobbying occurs at a national level, Herrera says they pay attention to Utah because of OR. OIA has pressured the state’s leaders for many years, most recently sending letters to Gov. Gary Herbert criticizing the state’s conservation and land-management policies. During the 2003 OR summer market, a compromise-ready Leavitt met with OIA board members and even toured the show floor (after which he was said to be overwhelmed by its size and impact), as both sides reached an agreement to protect more Utah wilderness and keep OR in Salt Lake City through 2005. Just a year later, the show signed a contract to stay in Salt Lake City through 2009 in return for a 145,000-square-foot expansion of the Salt Palace. Metcalf notes the difference this time around is the lack of a two-way conversation between the OIA and Utah’s political leaders that resolved the crisis in 2003. “We had the most responsive relationship with Gov. Leavitt and a solid, constructive relationship with Jon Huntsman,” says Metcalf. “But our relationship with the current governor and elected officials has never been worse.” He accuses Utah’s current leaders of failing to honor the commitments reached with the previous administrations. “The fact is that this state is associated with some of the worst policies regarding federal land in the country,” Metcalf says. But, to the greater OR community, all of this political bickering may look like a Utah family feud. Danner Footwear’s Nicole Orr has been attending OR for three years. She says she’s out of the loop on Utah politics, but she also doesn’t think it matters. “When it comes to decisions about the future of OR, I feel it’s better to do the right thing for members of OIA, and do the right thing for the folks who actually attend the show,” she says. Visit Salt Lake’s Scott Beck doesn’t see Utah’s land politics as a barrier to retaining OR. “We are very focused around the business opportunities and business environment for a trade show, and I don’t think politics will impact the discussion and the decision,” he says. But Mark Rasmussen, senior vice president at the Clearfield-based climbing-gear company Petzl America, Inc., disagrees. He foresees major challenges for Utah’s outdoor-recreation lobby if Outdoor Retailer stops coming here. “If Salt Lake City solves the logistic issues and the show stays, the political issues in Utah would continue to be worked on,” he says. “But if the show leaves, I think the biggest loss will be Salt Lake’s position as a bully pulpit to protect the outdoor community.” Rasmussen believes the biggest drawback of OR’s departure will be felt by the hikers, climbers, skiers and outdoor companies like Petzl and Black Diamond that call Utah home. Since all the proposals have been received from cities vying for the convention, the ball is in Nielsen’s court. There’s not much state or local government can do now to convince OR to decide to stay, unless they can wave a magic wand to double the size of the Salt Palace overnight. However, the OIA board of directors will meet with Gov. Herbert and his chief of staff on Aug. 1, the day before OR opens, to discuss the industry’s concerns over the state’s public-land policies. OIA hasn’t planned any specific events at the show regarding the pending decision, according to Lori Herrera, but they will continue to gather feedback through online forums and surveys. Asked when the final decision will be made, Herrera suggests it will be this year. There’s also one more factor that Haroutunian’s considering as he approaches a decision—the risk of moving a successful show. “One of my big concerns is that if we move, we move for the right reasons,” he says. If OR splits for Las Vegas or Anaheim, there’s a chance that a rival outdoor show could spring up to reclaim its mantle in Salt Lake City. The second scenario isn’t far-fetched. When limited space at the Indianapolis convention center forced the Performance Racing Industry (PRI) show to jump to Orlando in 2005, the unexpected move angered some longtime exhibitors. By 2009, a rival show calling itself the International Motorsports Industry Show (IMIS) that focused on the industry’s core appeal had returned to Indianapolis and signed a long-term deal with the city’s convention center, causing an ongoing rift in the racing-sports world. 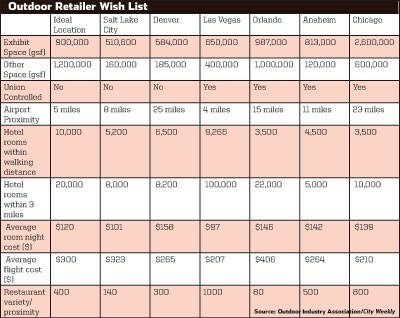 If somehow Salt Lake City comes out on top and Outdoor Retailer stays in Utah, we’ll never know if that scenario would come to pass. But as tens of thousands of outdoor aficionados overwhelm the Salt Palace next week and spill into the surrounding sidewalks and streets, the odds-makers in Vegas will probably increase their bets against Salt Lake City. Jason Stevenson is a Salt Lake City freelance writer and a former editor at Backpacker and Outside magazines. He also works as a freelancer for SNEWS, an outdoor-industry news source, reporting for the Outdoor Retailer Daily, the newspaper published each day during the OR show.